On a recent trip to Colorado, I had the opportunity to photograph the Garden of the Gods. This is a magnificent location to take pictures. Local knowledge advised me to visit at sunrise in the summer, which I hope to do later this year. This image was photographed after sunset, which provides a very different image compared to the gardens during the day. Rays of light create an expressive sky, and blue tones convey the icy coldness. To make a photograph such as the one above, scout out different angles to find the best light. I made several passes around the gardens looking for promising locations. Use a tripod and remote (or use the self timer feature on your camera). 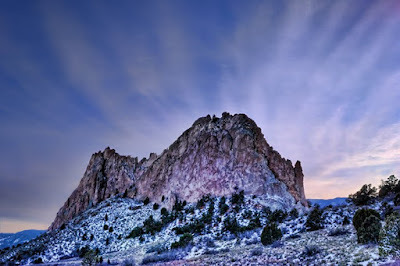 Consider HDR photography to capture the full range of light in your composition. Have fun shooting!